Rubenerd: #Anime Piracy boosts sales? Stop the presses! Next they'll be telling us DRM doesn't work, and that suing your customers doesn't good sentiment make. A prestigious economics think-tank of the Japanese Government has published a study which concludes that online piracy of anime shows actually increases sales of DVDs. No, really!? But this this goes against the narrative we've been forced fed! The conclusion stands in sharp contrast with the entertainment industry’s claims that ‘illicit’ downloading is leading to billions of dollars in losses worldwide. It also puts the increased anti-piracy efforts of the anime industry in doubt. Not to say I've ever pirated any anime, but if I did, I sure as heck have given them a lot of my time, money and business since. This is how promotion works, and in this case its even better because the producers don't even need to spend money on advertising. From my perspective [theoretically speaking], had I not downloaded anything from fansubbers, I theoretically wouldn't have got into this incredibly rich world of unconventional storytelling and art anywhere near as much as I have. I [theoretically] would not have bought as many VCDs and DVDs and figures and posters and music and magazines and all the other stuff. Even if a select few do nothing but leech, there are plenty of other people to fill in the gap. Theoretically speaking. Japan is an interesting case study in that the doujin and fanart communities are another testament to the nurturing rather than parasitic nature of people who take creative works, copy them and expand upon them. They don't leech off the success of creative works, they build an ecosystem around them. Still, as that example has been in the past, media cartels will no doubt be trying their best to silence and/or discredit these findings. Watch out for it. The ultimate question now becomes, how do we allow media creators to be compensated for their creativity with a sane, rational copyright framework in place that accepts (or at least tolerates) these activities? Unfortunately, as much as all this will continue despite what any lawmaker or DRM paddler says, and as much sense as all this makes, its still illegal. 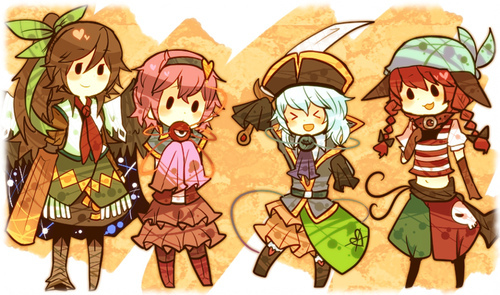 Adorable Touhou pirate graphic ID 15309430 from Pixiv. Older post → MacTheKnife is back in bidness!